We are so excited about this upcoming home for sale. 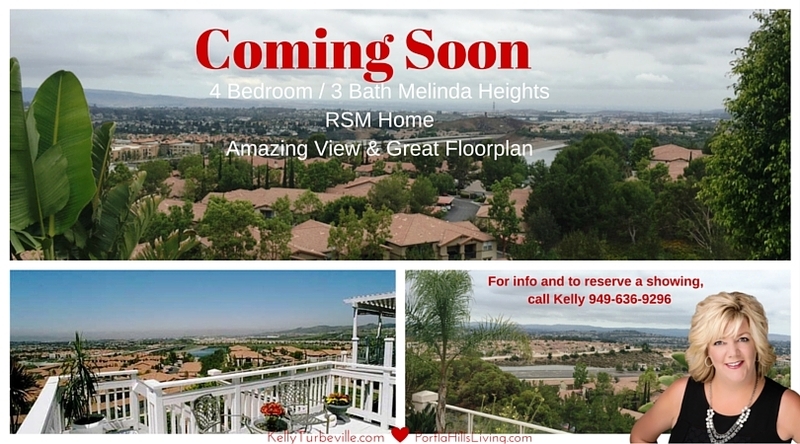 The home is located in our neighboring city of Rancho Santa Margarita. Seller is in the process of adding a few final touches and then we will have it open. I love this floorplan, as it is perfect for a growing family or maybe a professional who wants to rent out a room for extra income. As you enter the main living area is directly above with wood flooring and 4 picture windows that open up to an amazing view. The kitchen is open with granite counters, stainless steel appliances with a deck right of the kitchen for those summer evening and dinner outside. The mater bedroom is located on this level with a large adjoining master bath. As you come downstairs you will enter into the large family room with 3 adjoining bedrooms. From the family room, you have another access to spacious back yard and that amazing view. If your interested in more information on this home and to schedule a showing once it is live, please do not hesitate to contact Realtor Kelly Turbeville.